Spoilers for Commander 2015 are already upon us and you know that that means! Not as many new cards as were in Battle for Zendikar, but while it won’t mean much to predict the prices of cards that will be in Sealed product, it will be useful to predict which deck could be above MSRP in value and which older cards will be boosted by the new printings. Yes, this is very similar to my weekly column, which you should also read. Let’s get into it! This card is very, very good. I wrote in-depth about the cards I think could be boosted by this in my weekly article this week which will be published for everyone to read tomorrow, but, briefly, I think Serra’s Sanctum is a slam dunk. It scales very well with this card and is one the Reserved List. Heliod scales with it nicely as well, and with the option to play both, BW tokens/pillow fort could be very nasty. Daxos is very, very good, easy to trigger and cheap to play and activate. I have more picks in my article, but take a look at Serra’s Sanctum. It has a high buy-in but Gaea’s Cradle shows us how high it could theoretically get (not that a card that is multiples in Legacy is comparable in demand to an EDH card, though there are fewer Sanctums than Cradles). This card is nuts and I hope the rest of the deck has slick new enchantments. I think a lot of the obvious cards bolstered by this are inexpensive right now. Again, I covered this in depth in my article, but I will say that we could see renewed interest in Storm since this lets you play bigger spells than a Melek deck and theoretically makes Mind’s Desire a big player without you having to run mana-generating spells. This is harder to scale than the other experience counter generals but it’s worth it. Playing a very cheap Enter the Infinite or 11 point Blue Sun’s Zenith or Epic Experiment is going to feel very good, though there aren’t a ton of expensive rares that this grants upside. I have a sneaking suspicion that this will be much better than the experience counter commander in Golgari. 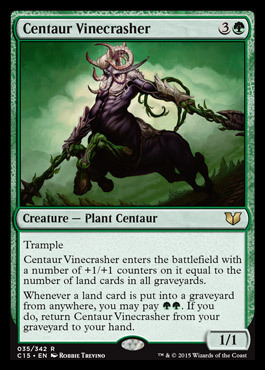 This is savage and gives a lot of cards already popular in Prossh deck some upside. 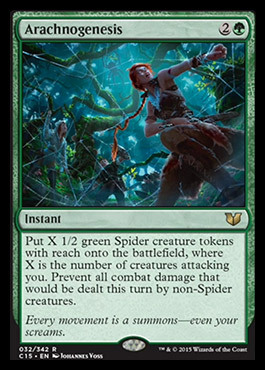 This will likely get jammed in Prossh, Ghave and Skullbriar decks as well as being a good commander in its own right. Greater Good and Grave Pact are cards I’m watching, but the list of potential upside targets is a long one. Angels are going to get quite a boost from this guy as well as cheap cards like Boros Battleshaper. This is going to make Sunforger a card as well, if you ask me. 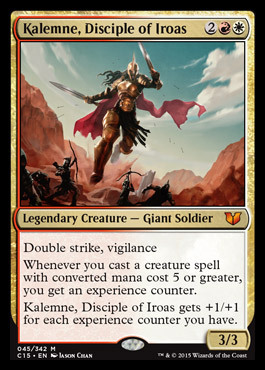 Big, durdly creatures are key here and I think that’s the way you build around this guy which is good since Boros is traditionally about tokens and small creatures. Sun and Inferno Titan are printed into powder but will get a second look, and Sunforger, down from a reprinting and Tiny Leaders turning out to be a total bust could get some upside, especially in foil. You kill them very quickly with a Sunforger on this double striking creature, after all, and grabbing a Ghostway or Master Warcraft as a combat trick wins games. This isn’t the most exciting Simic Legendary creature, but that’s OK with me. 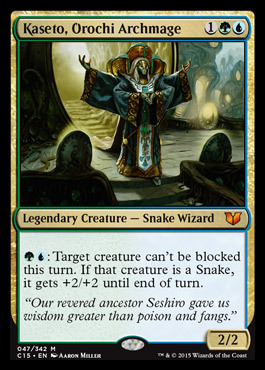 People will absolutely build snake tribal and there are a lot of cool snakes, especially legendary ones from Kamigawa block. A lot of the snakes do stuff when they deal damage and with the ability to make the creatures unblockable is underrated, currently. Nature’s Will isn’t a snake but it’s snake-flavored and it has real upside as well as Lotus Cobra and a few Legendary snakes, Time of Need and cards like Ohran Viper. Even Mystic Snake is great in a deck with this. Tribal staples will get another bump as people with tribal decks build yet another one. This card is insane. I have written about a lot of the cards that get upside here and I don’t want to rehash too much of the article I wrote this week here, but the list of cards that get upside from this guy are almost too many to name. This doesn’t say “non-token” or “cast” and I think it’s actually irresponsibly good. Dumping the counters on a Master Biomancer to make everything huge, or taking infinite turns with Sage of Hours or going to Hydra town – this guy does it all. I plan to brew a deck with this in my Gathering Magic column this week and the cards in that deck are all likely getting upside. This card is insane. 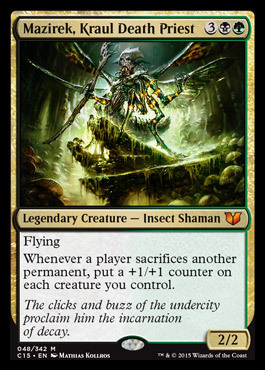 Depending on how many of the decks this is in, this has very limited upside, but what it does do is make people take a second look at Phage, the Untouchable as a Commander which I think is worth doing. At $15 in foil and $2 in non-foil, though this has had a few printings, I bet this gets a second look. If this goes up, it likely brings Torpor Orb along with it, and Torpor Orb is a card that’s going up eventually anyway. I’m surprised it’s still so cheap. Torpor Orb is literally my only “want” card on PucaTrade, that’s how many of them I want. 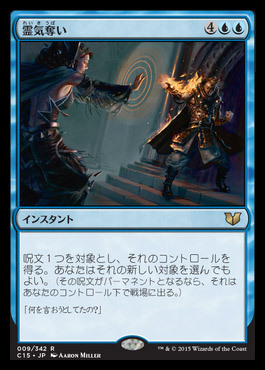 This is very good in Sidisi decks and milling out your opponents is non-trivial. Getting a ton of tokens for hurting their strategy is saucy, and Doubling Season, Primal Vigor and even Parallel Lives could be impacted. This card is likely not going to see much play, ultimately, but I like it in a few decks. Ultimately, the list of cards affected by this is too long to name. Any creature with an ETB trigger is savage with this. 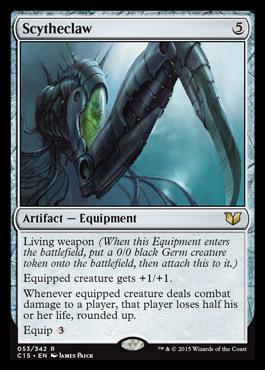 I would focus on equipment tutors if we’re trying to home in on cards with upside granted by this card. This could ultimately be a bust, but it just seems so, so good primae facie and I think ultimately having a bunch of extra copies of utility creatures come into play when you attack is going to win games. Imagine you put this on a Woodfall Primus or Frost Titan. This card is a player. Who wants to pay 2 extra mana for a worse Quietus Spike? Remember I said a few places I figured Mazirek was so good it would be better than the Golgari experience counter card? My first thought looking at this card was complete incredulity. This card would be ridiculous without the whole “otherwise put it in your hand” caveat. This card is stupid good. It’s likely to grant upside to all of the same cards that Mazirek does as well as financially-irrelevant cards like Fleshbag Marauder. Sac outlets are especially juicy with this card. I’d watch Black Market, High Market, Greater Good, Miren, the Moaning Well and foil Perilous Forays. It’s too bad this has no black in it. Imagine this in a deck with Sorin Markov, Sorin’s Vengeance and Magister Sphinx. Still, this dirty angel does some work. 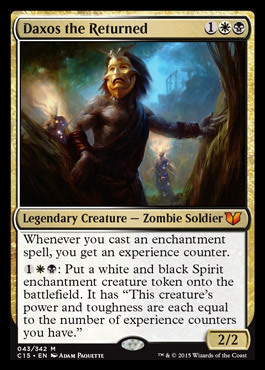 I don’t think you want this as your commander, but I’d say jamming this in a Gisela deck would be sweet. 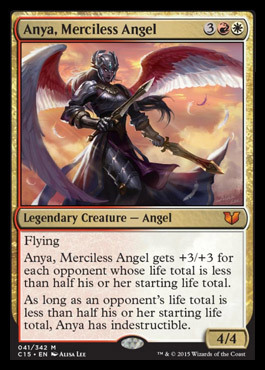 I don’t think this is good enough to make Kaalia of the Vast move on its own, but between FTV angels and the Gisela reprint in C15, I think we will see Kaalia move organically. Angels are popular and while this isn’t an impetus, it’s weight on the scale and that matters, too. I predicted that we would get a card that was a new card that could get played in Legacy and that would be responsible for a lot of the value in the Izzet deck. I think this is it. If you play enough mana-generating spells and cantrips, this card lets you replay all of them and storm out. This is better than Ill-Gotten Gains and Past in Flames combined. This is Legacy Storm ready and it’s very good. How much money this ends up being worth, I can’t say, but this is going to help sell Izzet decks. Nekusar decks gets a boost from this but that’s about all. 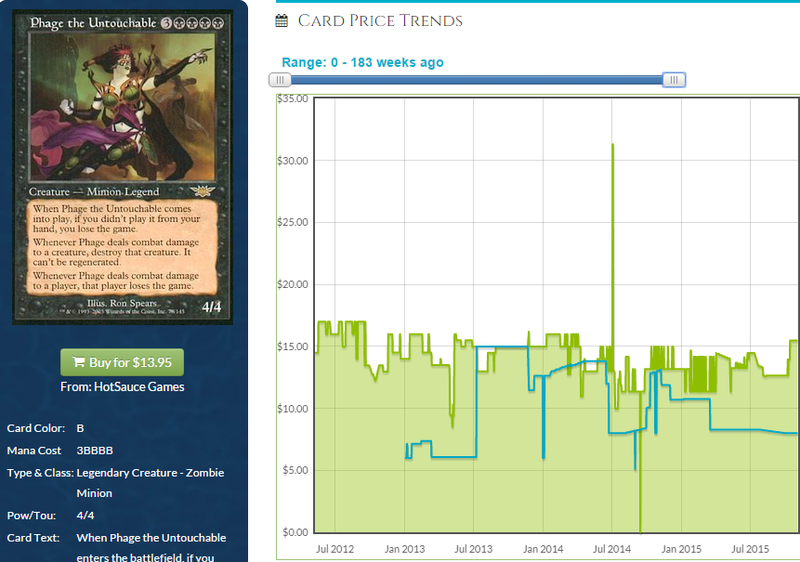 I don’t see this pushing anything up a ton since all of the Nekusar cards already spiked. This is just a less reliable Wheel of Fortune. 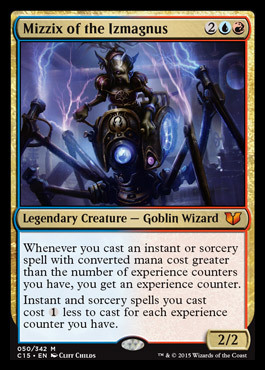 Could it be part of a cycle of awesome Magi imbued with sweet spell power? Maybe! This is a good rate for Oblivion Ring universe. 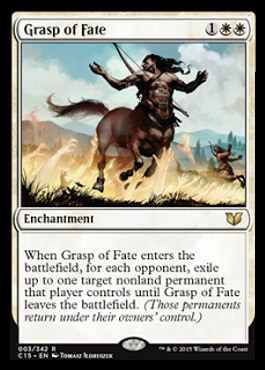 This will be an EDH staple and I bet it’s going in the Black-White deck which means it’s a reason to buy that deck. This seems like a $5 card in the short term. The same CMC as Mass Polymorph but playable at instant speed? Count me in! This card is absurd. Will it be financially relevant? Look at Mass Polymorph for the answer to that question. This card is stupid good. It’s a better Commandeer if you’re OK paying the mana cost, a better Desertion, a better Spelljack. 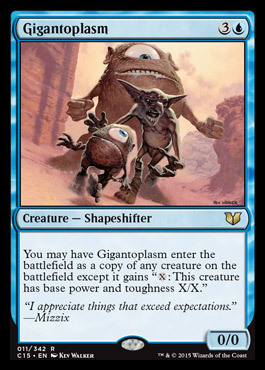 This card is what EDH players have always wanted. 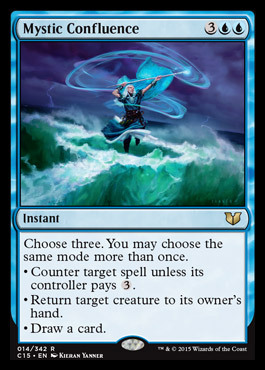 I imagine if people are overly excited about Mizzik’s Mastery, it could push the cost of this spell to about $1. If it does, I’m all in. Clone is playable in EDH and this is better. Unfortunately, cards like this are role players. They’re not going to push anything up but they will be worth money and any time there is an impetus for speculators to buy these sets because a card in them is selling for more than the MSRP of the deck, the other cards in them get pushed to nothing and that’s a good time to buy. This will be worth more than bulk and that’s the price I want to buy these at. This will never be Phyrexian Metamorph money, however, so don’t go too deep on these. It’s just a better clone. This is pretty balanced, unfortunately. 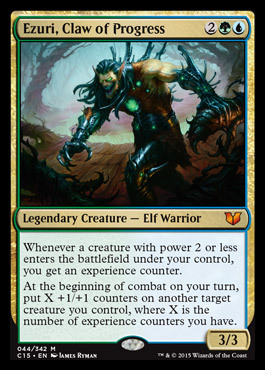 If this is your commander, the only way to cheat counters onto him is to proliferate with artifacts. Of course you could always do things the hard way and play a lot of lifegain. Making tokens with Soul Wardens out is one way to do it. Still, I’m not impressed with this creature. I imagine the fact that we’re getting cards like Black Market in the Daxos deck is going to crush mediocre cards into powder and I expect Karlov to be among the casualties. He’s good, but fair. Too fair. This is better than the white one, but not great. This is a bulk rare most likely. I love 6 mana ramp spells to really help me get over the hump. 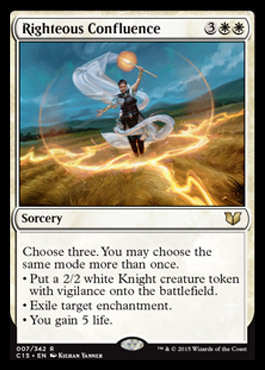 Even though you can use this to draw three cards, I’m not sure the lack of a “tap all of your opponent’s creatures” mode won’t keep this from seeing play in a Universe where we have access to Cryptic Command. People anticipated this card would be legacy-playable and they are likely pretty disappointed. 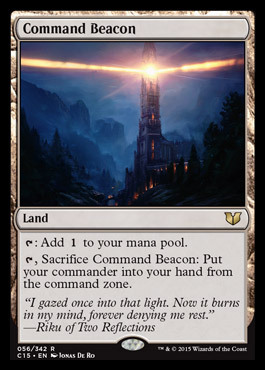 This card is fine, but Cryptic Command is much better and I don’t see playing both. Are you already playing Jace’s Ingenuity? Congrats, they printed a rare version that’s a little better. This card is legitimately very exciting. Master Biomancer that doesn’t require you to play blue? This is going to be a card that people want multiple copies of for multiple decks right out of the gate and I could see it being worth a few bucks. This card is stupid and though it won’t replace Master Biomancer in my Vorel deck, it will supplement it. 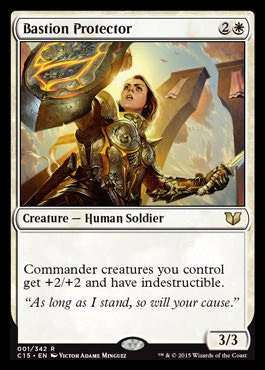 This card is very exciting to people with vulnerable, low-toughness Commanders like Gaddock Teeg, Rubinia Soulsinger and Geist of St. Traft. I imagine this becomes somewhat of a staple initially, but I don’t know that it will play as well as everyone hopes. Still, expect this to be money for a minute. 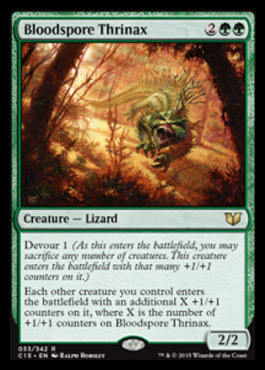 Not every Fog gives you a ton of creatures and a ton of experience counters on Ezuri. This is powerful and narrow, a perfect recipe for not much money now and some money potentially later. Let this hit bulk. If EDH decks could have sideboards, this would be a sideboard card. 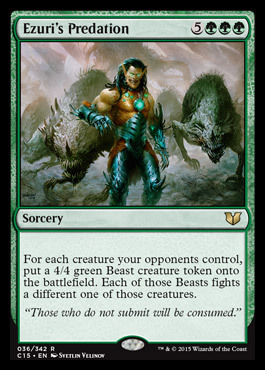 This is a green wrath of God or a way to spend 8 mana and watch a bunch of 4/4 creatures die. 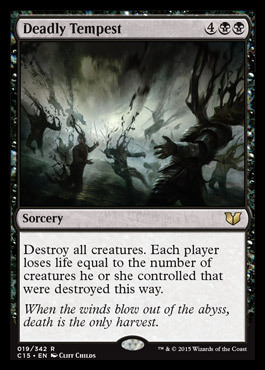 If you can benefit from that situation with a Fecundity or something, go for it, but this seems like it’s hard to benefit from and 8 mana spells better win the game almost on their own. This is so much better against some decks than others, this also feels like a sideboard card. I don’t see a reason to play this over Decree of Pain. This could easily have been uncommon. 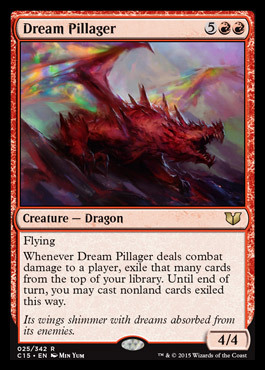 Whenever Dream Pillager deals combat damage to a player, exile that many cards from the top of your library. Until end of turn, you may play nonland cards exiled this way. Meh. I’m not super stoked about this since you have to pay the mana costs and it’s tougher to serve than you might think starting around turn 7. There aren’t a ton of dragon slots in most decks and I’d much rather steal all of their artifacts if I hit them with a dragon. I’m not sure this was made for EDH. This seems like a card that players are going to try out in Legacy, either in a New Horizons variant or dredge or some new kind of deck. This could potentially be a lot of money if people want it for Legacy, but with its place in the meta being unclear and SCG withdrawing support for Legacy as a format, its future is pretty murky. Ultimately, in a Titania deck this could thrive but it’s narrow although powerful. 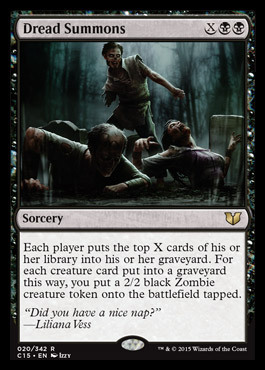 I like the idea of playing it and saccing it to Greater Good only to make it larger and larger as you discard cards. I am not so sure I want my flames shifting this often. Teferi’s Puzzle Box is cool because it screws up your oppponents’ plans and forces them to draw a ton of cards and take a ton of damage from Nekusar. This messes with you alone and also sometimes helps you take a ton of damage from their Nekusar or fuels their Consecrated Sphinx. Someone explain to me how this isn’t all downside. 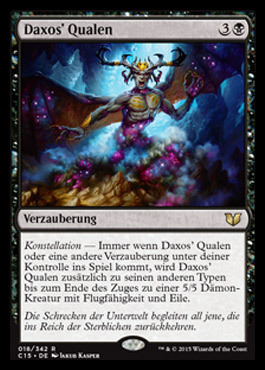 Constellation – Whenever Daxos’ Torment or another enchantment enters the battlefield under your control, Daxos’ Torment becomes a 5/5 demon with flying and haste until end of turn in addition to it’s other types. Eh. I’m not thrilled by this at all. I feel Daxos’ pain every time I find this in my hand instead of a card that affects the board. 4 mana is not a good rate for a sometimes 5/5 flier. 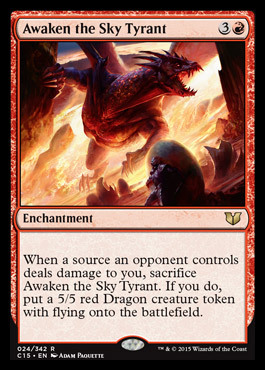 It’s better than Awaken the Sky Tyrant, but that’s damnation by faint praise considering so are some of the commons in this set. I could see looping this with something like Tooth and Claw and Parallel Lives but you also need a way to benefit. Getting back a generic 6/6 for 2 tokens can be OK but I think this feels a little to balanced for you to trifle with. This is a good card if you’re playing the precon against another precon, but this seems like trash to me and a bulk rare unless I’m missing something huge. 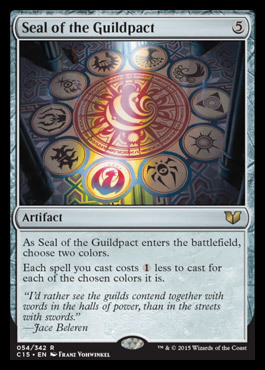 I think the best thing about this card is the art, even though the wrong guild is illuminated. 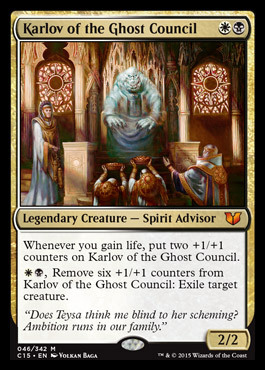 EDH players love cost reduction, and the chance to reduce their gold spells by 2 colorless will appeal to people a ton. I could see this climbing to a few bucks over the long term but getting crushed to powder in the short term. There may be opportunity here. Jason – do you have any data to back up card values rising based on the Commander series printings? If you do, that would be an interesting article in its own right. I’m just afraid you may be saying all these impacted cards will rise in value with no evidence to suggest newly printed commanders will increase other existing cards. 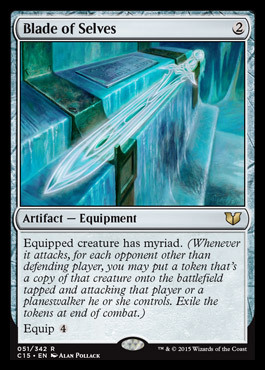 The foil spiked predicated on experience counters. I think the non-foil rising was premature considering it’s a likely printing in one of the decks, probably simic or golgari. The series I’ve been writing for about 6 months is entirely predicated on that being taken as a given. I guess I could write an article that demonstrates the historical cases of emerging archetypes but that was something I thought was understood. For a quick example, check basically every wheel effect as well as Forced Fruition and Wheel and Deal and look at the date they spiked relative to the printing of Mind Seize. Mazirek, another Worm Harvest enabler. Imagine putting Blade of Selves on a Craterhoof Behemoth…. Umm Jason, did you misread or something? 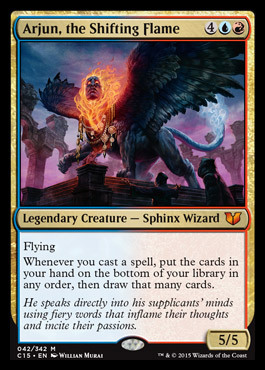 Mizzix’s Mastery makes copies. It doesn’t add up into the storm count. I think Kaseto is getting overlooked because he seems limited to tribal snakes. But he’s not. Notice that he can make himself unblockable. 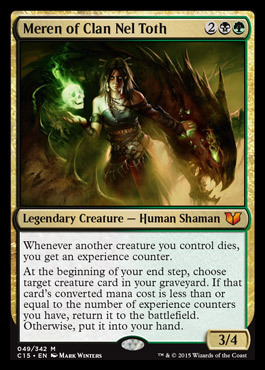 As a commander, that’s quite good, Sure, Thassa can do the same thing, but Thassa doesn’t have access to the massive pump spells and counters that simic does. Is it just me, or did WotC design these specifically so that no card would start with an initial (or presale) value as high as $10?